Home > Car Care Products > Vacuums & Blowers > McKee's 37 Turbo Car Dryer New & Improved! 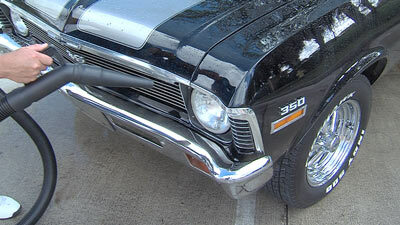 Modern clear coat finishes are extremely scratch sensitive – that’s a fact. You have to ask yourself this question: does repeatedly rubbing a towel across the paint make it better? What’s the opposite of better? WORSE! 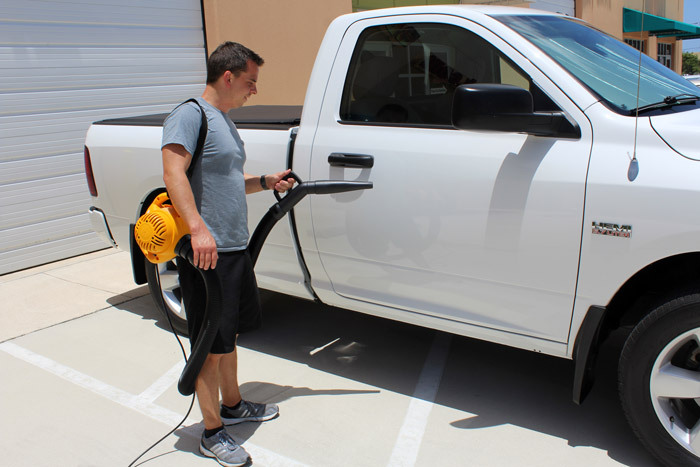 You can be as careful as can be, but sooner or later you will create micro scratches and swirl marks by repeatedly rubbing a leather chamois or drying towel across your vehicle’s scratch-sensitive clear coat finish. Cut down your towel usage with the McKee's 37 Turbo Car Dryer. McKee's 37 Turbo Car Dryer was designed by car guys for car guys (and gals!). Forget dealing with annoying water spots caused by water that was hidden behind emblems and between body panels – blow it out with the McKee's 37 Turbo Car Dryer. Let’s get to the specs: First and foremost, we weren’t kidding when we said the McKee's 37 Turbo Car Dryer was designed by car guys for car guys. First, the unit packs a whopping 6.5 peak horsepower motor that draws its power from a 35 foot power cord, eliminating the need for extension cords and helping you avoid electrical shock altogether. Second, the air is heated and filtered, meaning you’ll never blow dirt, sand or leaves into your precious clear coat finish at high velocities. Third, the 6 foot flexible hose features a vinyl-coated nozzle that will not scratch or mar your paint if contact accidentally occurs. Fourth, the included shoulder strap provides added convenience. Last, but certainly not least, the McKee's 37 Turbo Car Dryer is proudly MADE IN USA. McKee's 37 Turbo Car Dryer is powerful enough to dry your entire car without taxing your muscles. It only weighs a couple pounds, and the 6 foot hose is long enough to reach the roof of most vehicles. If it doesn’t reach all the way, the powerful 6.5 peak horsepower motor packs enough of a punch to blast the water off, even if it’s held a couple feet from the panel. 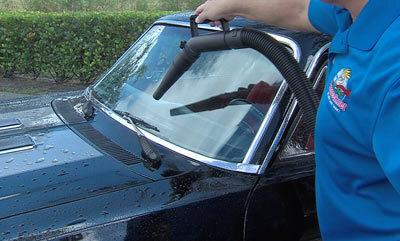 You’ll love using the McKee's 37 Turbo Car Dryer on wheels and tires after you wash your car. Most new vehicles have complex wheel designs where water loves to hide, and we all know there’s nothing more annoying than drips of water running down your tire as you apply a coat of your favorite tire gel. Water cannot hide from the McKee's 37 Turbo Car Dryer and its 6.5 peak horsepower motor! Blowers are no substitute for towel drying unless you absolutely need no-touch. Where they excel is getting into tight spaces. Works best to have a towel in hand to get water that's blown out. The shoulder strap needs to be tied off once you find your adjustment point. Iâ€™ve been thinking of buying this for probably over a year and finally did it and Iâ€™m glad I did. Itâ€™s very easy to piece together and works great I havenâ€™t had to wipe any part of the car with a towel and getting all the water from the rims is a breeze. Blower works well with good amount of power to clear water off vehicle. Gets uncomfortable to hold and almost awkward. Hose is stiff and could be smaller diameter. No way to set the blower down that makes any sense. Two handles? Not sure why, donâ€™t seem to make any sense either. Shoulder strap is cheap and borderline useless. The long power cord is nice but no way to store it. Itâ€™s hard to even hang to thing on a wall. I cut the power cord off to a 12â€ pigtail and put a new end on both cut sides using the rest of the cord as an extension. These are only my personal opinions. It does what itâ€™s supposed to do well, just terrible ergonomics.